Fantasy Flight Games is happy to announce a new singles release for Tannhauser: Edison. He looks like he'd go well with Kate from a couple udates ago. 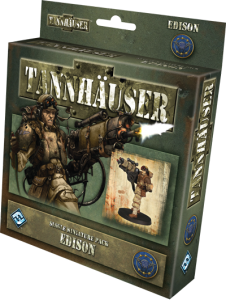 Fantasy Flight Games is pleased to announce the Edison Single Miniature Pack for Tannhäuser! This heroic expansion includes one beautifully painted figure and accompanying character sheet, an all-new scenario, and all the tokens and equipment cards necessary to bring Edison’s inspiring leadership to your battles.